NEW YORK - Albert Einstein would have been pleased, but maybe also a bit surprised, by this week’s release of the first ever close-up image of a supermassive black hole. Early speculation about black holes fell straight from Einstein’s 1915 theory of general relativity, but the great scientist himself thought the idea was a little too weird to manifest itself in the actual universe. 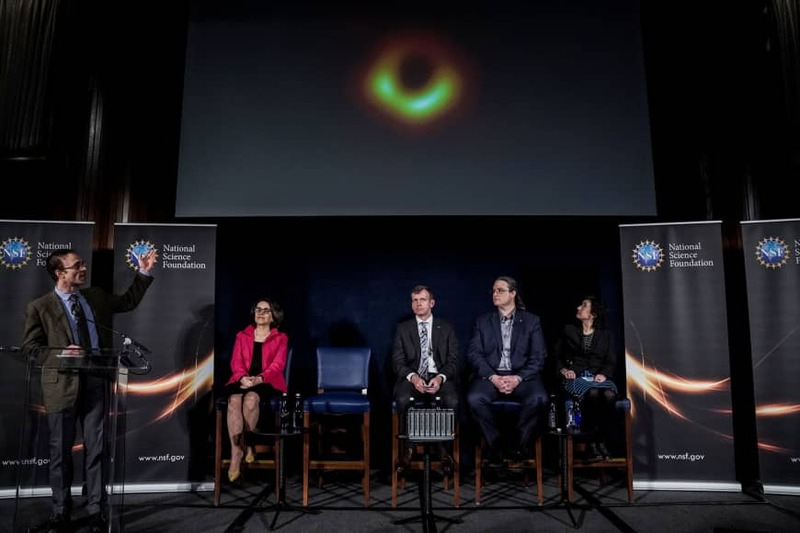 Kennefick said it required scientists to get over a few mental barriers to recognize that real black holes lurk out there, including the monstrosity in the new image, with an estimated mass equivalent to 6 billion suns. The doughnut-shaped glow of the image was not the actual black hole but delineated a kind of shadow of the region known as the event horizon, inside of which even light can’t escape. The event horizon is about as wide as our solar system, but the mass of all those suns may be packed inside of a speck. The first person to take up the cause of black holes was a young astronomer named Subrahmanyan Chandrasekhar, who, back in the 1930s, argued with the famed Arthur Eddington that a big enough star might collapse indefinitely. Eddington won by sheer authority, but later in the decade Robert Oppenheimer took up Chandrasekhar’s idea, at least until his energies were diverted to the Manhattan Project. In the late 1950s, astronomers started to observe distant but ultra-bright objects, dubbed quasars, which were hard to explain, except perhaps as a manifestation of some extreme condition. And so astronomers started a series of collaborative meetings with physicists, called Texas Symposia, to figure out what was going on. Other big names started to look into understanding black holes, assuming that they might be real objects. Stephen Hawking and Roger Penrose expanded our understanding of black holes and another extreme condition — what occurs if you extrapolate the big bang backward in time. All this helped give impetus to the search for real black holes, said Kennefick. Seeing such things is like observing the wind — watching the way these invisible objects move and affect visible stuff around them. By the early 1990s, scientists found a number of stars that were being whipped around by what could only be a very massive but invisible companion. Also in the 1990s, the Hubble Space Telescope helped nail down the existence of super-massive black holes accumulating in the centers of galaxies — including our own Milky Way, where there lurks something with the mass of 4 million suns. The black hole whose images were announced Wednesday is about 1,000 times bigger — based on estimates that scientists made using the motion of gas and stars in its galaxy, called M87. To actually get up close to the event horizon required a 10-year international project coordinating eight far-flung telescopes, including one at the South Pole. This required super-sharp vision. Though the black hole shadow cast in M87 is the size of our solar system, the galaxy itself is 55 million light years away. As The Washington Post put it, this is equivalent to seeing a doughnut on the moon. 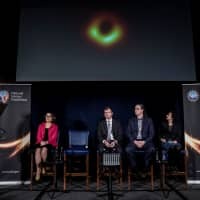 At a news conference Wednesday, the team leaders said what they saw was exactly what Einstein’s theory would predict — a circular “shadow” surrounded by superheated material, emitting photons that were just far enough from the black hole’s pull to escape and reach Earth 55 million years later. Scott Tremaine, an astronomer at the Institute for Advanced Study, said that the image is a little bigger than the actual event horizon because of the way the black hole deflects the path of light. So what’s inside this point of no return? “We don’t know,” he said, but Einstein’s theory predicts that various quantities, such as the density, go to infinity — a situation called a singularity. A singularity suggests the theory isn’t working — that there is some actual, explainable, physical situation in there, but that understanding it requires a new theory, probably one that unites Einstein’s gravity with the laws of quantum mechanics, which rule the universe on small scales. But here’s the question we really need to have answered: Will black holes eventually eat the universe? No, Tremaine said. Even those supermassive monsters probably grew much faster when they were younger, and they eventually slow down.